What is it that makes the journey of going to a concert almost as fun as the concert itself? Is it the soundtrack or playlist of your road trip? Is it the people you’re with? Is it the buzz of excitement and sense of freedom you feel as you all cruise down the road toward your shared destination of pleasure and escape? And what happens when you take all those communal experiences and use them to create an interactive, virtual and real-world concert road trip game? When I think of my favorite concert experiences at Rothbury, moe.down and Lollapalooza I remember how fun it was just getting to the show. That’s mainly because most concert fans love road trips. But why do we love road trips? That’s a complex question. But one thing I can simply say is that the road trip is a powerful experience for all concert fans. And what makes it so powerful and memorable is the people your with and what your listening to and that fact that you’re all experiencing it together. Whether it’s said through conversation or just felt mystically via the music blasting through the speakers, one of the main reasons why I think we love road trips is because during the road trip all of our individual thoughts, feelings and unsaid longings to escape somehow cosmically flow together into one big psychological sea of communal pleasure. And whether it’s a cross-country journey or a one-night elopement, road trips to concerts empower us to leave behind the past for a moment while we blissfully speed towards our shared destination into the beautiful escape of the live music experience. Writing this post instantly sent my mind racing with memories of Colleen and I traveling to and from our favorite concerts. And ever since our last chat on the road, I’ve been looking for a way to discuss the topic of the road trip playlist and the pre/post-concert car ride experience with you. 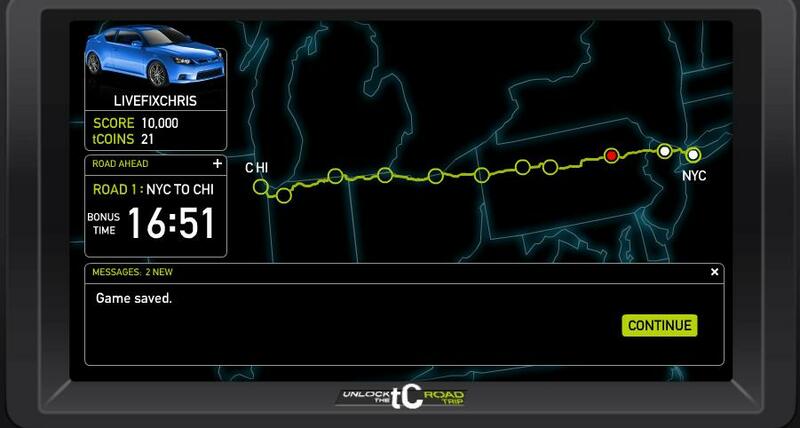 And since Scion has unveiled their Unlock the tC Road Trip Game, we now we have the perfect opportunity to do just that. Fast and Furious meets Nick and Norah’s Infinite Playlist. 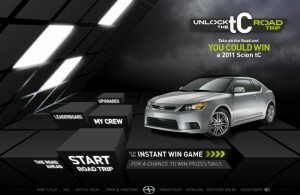 Earlier this month, Scion launched their all-new Unlock the tC Road Trip Game – an eight-week, interactive and real-world competition that traverses cross-country and allows players a chance to win the all-new 2011 Scion tC. To give you an idea of the concept and experience, I would say the game is an extremely fun and addictive mash up of Fast & Furious meets Nick & Norah’s Infinite Playlist . There’s fast cars and quick decisions that need to be made while your crew works to beat the clock and get you back on the road. But there’s also a very fun element that conjures the excitement of trying to find a secret show and traveling around the city with a group of friends while you all celebrate your shared love for music. To provide the soundtrack to the Unlock the tC Road Trip Game, Scion’s lifestyle arm, Scion Audio/Visual, created a specific playlist of beats, grooves and rhythms comprised of genres from dubstep and garage to nu disco, metal, beats and dance. All of which have been perfectly picked to enhance the game’s interactive meets real-world situation road trip experience. Aside from being the soundtrack to the game, the playlist alone has been one of my recent favorites for finding pleasure between my headphones. And beyond that, top to bottom the Scion playlist is stacked with big bottomless beats and righteous electro grooves that most music fans would want to rock to, pre and post-concert. It’s solid selection of tracks are grooving, sub-woofer rattling and gloriously hypnotic — all necessary musical ingredients for creating a bangin’ road trip playlist. As I mentioned, The Game started on the first week of June, and each week through the end of July a new Road is “unlocked” and ready to be discovered. I hope you enjoy it as much as I have so far. And it should be fun to see how this contest turns out. The game is a points based and whoever has the most points at the end of the 8 weeks gets the chance to win a new Scion tC and VIP passes to the finale, a live concert event in Los Angeles featuring performances from The Spits, 12th Planet and Rob Wonder. So without further ado, here are the full details, a link to the game soundtrack and a video with more info. And if you have any questions about the contest, or you’d like to share your own concert road trip stories, please go ahead and share ’em in comments below. Accumulate points and unlock daily prizes. Share your own road trip playlist tunes on Scion’s Facebook Page and get a feel for the Game by checking out the video below.